Waxing Nostalgic is an ongoing series of articles shedding light on albums from our past, or ones that have gone unappreciated and overlooked for too long. In 2006, The Kids At The Club: An Indiepop Collection was released and perfectly encapsulated an entire musical movement in exactly 19 songs. The compilation was released by London’s How Does It Feel To Be Loved? club night, which was the kind of event attended by excitable youngsters who would turn up in droves, only to leave and start their own bands. Inspired by the sounds of Sarah Records and Belle & Sebastian (AllMusic notes that there are no less than two B&S shirts within the liner notes of the compilation), the variety of artists on the album included both promising up-and-comers and genre mainstays like Tiger Trap. Sequenced right at the top of the album, was Voxtrot‘s song “The Start of Something”. The bouncy, clean-tone guitars and melodically fluid bass set the tone for the entire record. Here is a song that is entirely earnest, free of pretense, superbly catchy, and full of the kind of post-break-up dramatics that had reviewers running for The Smiths references (a quick Tumblr search reveals it’s still one of the most popular songs they ever released). “The Start of Something” was an immediate highlight off Voxtrot’s debut – the Raised By Wolves EP – released just a year prior to The Kids At The Club. In 5 songs, totaling just over 23 minutes, Voxtrot proved themselves a staggeringly talented and infinitely promising group. Economically arranged, yet surprisingly varied, the tracks move from breezy pop to subtle post-punk with a wave of a hand. The tempo on the EP’s title track goes from a driving jangle, to a double hi-hat groove chorus and back again, instantly letting you know that you’re in capable hands. This isn’t the sound of a scrappy band, fussing through structural experiments, but that of a finely tuned hook-machine – where around every corner is a new melody to obsess over. For their follow up, Voxtrot released the Mothers, Daughters, Sisters & Wives EP in 2006 – again top-loading the title track. There are days that I revisit this song and wonder if it is maybe one of the catchiest pop tunes I’ve ever heard. Delayed guitar chords echo off wiry lead-guitar lines as cymbals crash, only to recede and return at a moments notice. To say the album was a step forward – production wise – would suggest too large of a change. On the surface, their sound remained the same – there were plenty of post-punk bass-lead breakdowns, chiming guitars and all the clever structural quirks had returned. The band did manage to sneak in some strings, piano (“Rise Up in the Dirt”), rhodes and horns (“Soft & Warm”) though. Despite the additions, it never felt like they dominated, instead seeming to compliment the songwriting – as opposed to being the driving force. And so, after two critically successful EPs, it came time for Voxtrot to record a full-length album. Having released exclusively on the EP or 7-inch format until now, the band hopped from an indie label to Beggars / Playlouderrecordings (thanks due in part to the MP3 boom of the aughts) for their 2007 self-titled LP. Working with producer Victor Van Vugt (who has produced Nick Cave and the Bad Seeds, P.J. Harvey, Gogol Bordello and more), the band took the subtle expansion heard on Mothers, Daughters, Sisters & Wives and really made some changes. Big indie-orchestra swells of eclectic instrumentation can be heard throughout Voxtrot, and unfortunately here the production flourishes do take the wheel – leaving the fine-tuned hook machine I mentioned earlier sounding a little lost. From the bleech!-inducing ballad “Real Live Version” (quiet and exposed was never really vocalist Ramesh Srivastava‘s lyrical strong suit) to the overreaching of “Blood Red Blood”, the album just never seems to find its footing. The ultimate irony, is that in the process of expanding to the full-length format, Voxtrot ended up releasing a perfectly enjoyable EP. “Kid Gloves” is a fine update to their style, and “Firecracker” stands toe-to-toe with any number of their earlier tracks. There’s just too much here that lands as forgettable between all of the highlights. As Pitchfork points out, “it was simply turned around too quickly”. It’s rare for a young band’s debut record to come out fully formed, and maybe that’s why it was so disappointing to hear a band with two, well, firecracker EPs under their belts turn out something so… uninspired? Pitchfork’s review also ruminates on the pressures the band placed upon themselves to achieve lofty goals with the debut, and it’s an analysis that – even when paired with a cursory listen to the album – seems apt. It’s a big record; at once reaching out in far too many directions, though a few times throughout, it does land gracefully. In 2009, the band re-appeared to release “Trepanation Party” – recorded with Jim Eno of Spoon. The song is one of the band’s biggest left-turns ever – focusing much more on a driving, Spoon-esque drum beat, bombastic piano and frequent synth-stabs. It’s certainly not one of their best songs, but the huge leap in sound at least distances itself from their early work, rather than existing awkwardly in-between like much of the self-titled album. One wonders optimistically what kind of Voxtrot album would have been born of a collaboration with Jim Eno – certainly “Trepanation Party” suggests it would have been an interesting one at the very least. 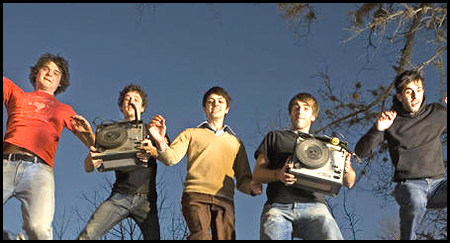 After yet another return – this time to the 7-inch format – the band announced their break-up in 2010, citing that “the career path of Voxtrot was truly one of long, simmering build, explosion, and almost instantaneous decay.” Ramesh expresses a lot in his goodbye note, including the need to move forward in the face of fear and mounting pressure for musicians to “return to the sound of their earlier, more popular work”. As disappointing as it may be for me, as a listener, to hear the potential of an album like Voxtrot seemingly un-capitalized, there’s also something to be said about how it perfectly encapsulates a band in transition – warts and all. It’s just too bad we never got another album from the band, to see what they were transitioning into. As for now, you can listen to Ramesh Srivastava’s current solo project Ramesh, while Jared Van Fleet went on to release material under the Sparrow House moniker, Matt Simon and Jason Chronis performed in multiple groups together – including JC & Co. and The Black, while Mitch Calvert performed with International Waters.